If you want to host a successful Corporate Event in Elm Groove, Wisconsin, you will want to pay close attention to the music that you select for your event. Live, dinner or cocktail piano music is often your best choice. Bands or DJs are great for dancing (especially at a big corporate event with hundreds of attendees in a large ballroom). But what about the casual drinks in the bar or the reception or social time leading up to the Dinner? These are where the vital first interactions or impressions take place that you want to foster with your clients in order to insure a successful party or corporate event. The smaller the corporate event — such as a Dinner Party in your home or at a local hotel or restaurant — the more important it is to have the intimate sound of live, professionally played dinner or cocktail piano music to set the tone for the entire evening. People — especially your quieter guests — generally find it much easier to socialize when stylish dinner or cocktail music is being played in the background. Beautifully performed piano music is a perfect way to make all of your clients feel welcome, relaxed and comfortable and able to carry on an enjoyable conversation. Dinner or Cocktail piano music instantly provides a focal point or “conversation piece” for your Corporate Event. Everyone loves piano music and people are always happy to talk about it even with complete strangers. 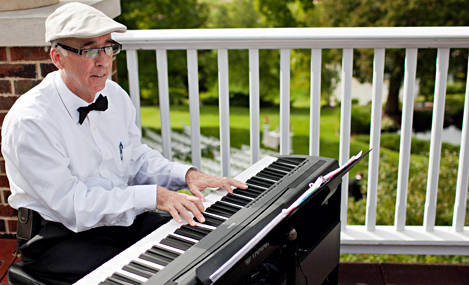 Once the dinner or cocktail music “breaks the ice”, live piano music can continue to provide a sociable atmosphere for casual or serious conversations through the rest of the evening. To Listen to or Download Samples of Patrick Byrne playing Dinner and Cocktail Piano Music, please go here. To request a quote for your Corporate Event in Elm Grove, Wisconsin, please call 262-893-1759, email me today or use the form at the bottom of this page. Photo courtesy of John Hainstock Photography. Please use this form, call (262)893-1759 or email me today to request a quote for your Party or Special Event.